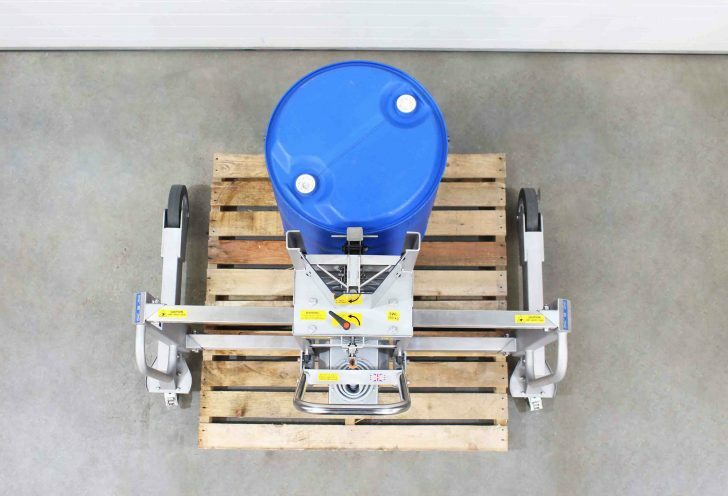 This drum unloader will improve the way you take drums off pallets saving both time and money. 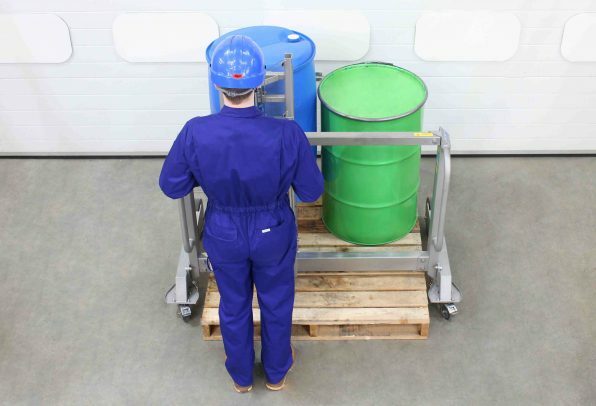 From just one side of a 1200mm x 1200mm pallet, four drums can be unloaded with ease. The unique over-pallet design allows the lifter body to move effortlessly over and above the pallet. 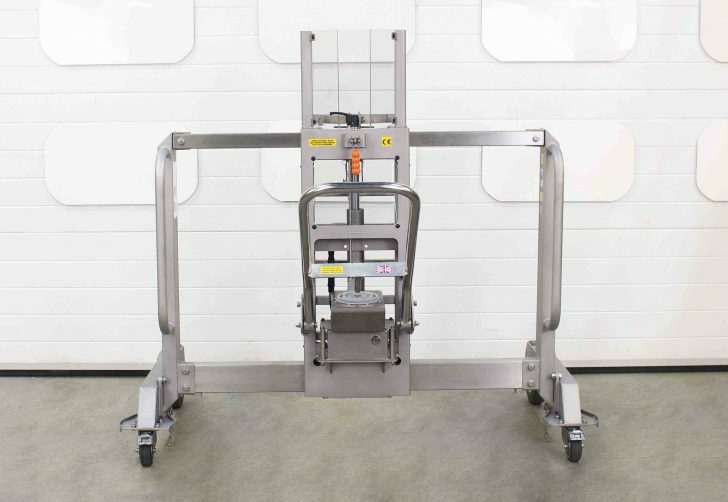 The model shown is constructed from 304-grade stainless steel and has a smooth clean finish; designed for use in pharmaceutical or food production facilities the drum lifter is robust and hard-wearing. 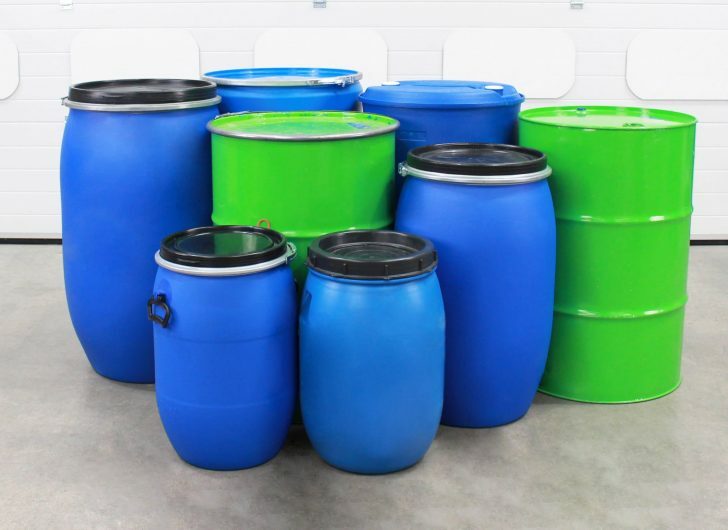 Drum types and sizes are abundant, as such the versatility of drum loading equipment is very important. 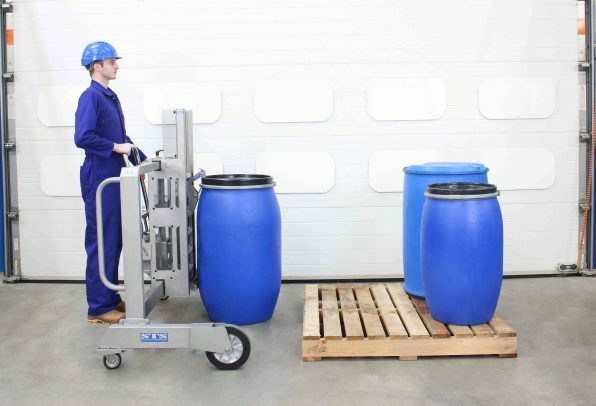 With our tried and tested drum gripper, drums from 50 to 220 litres in volume, both steel and plastic can be handled with ease. 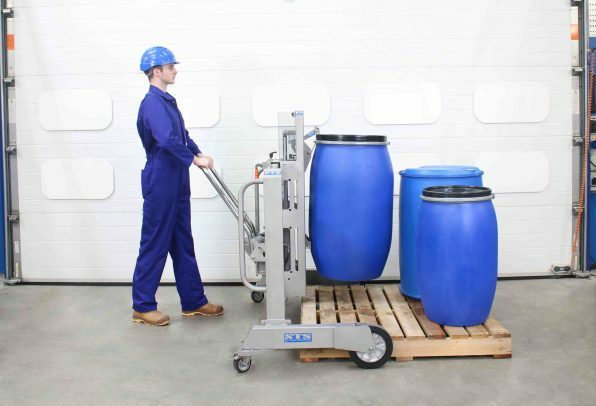 Even HDPE MAUSER drums are easy to handle with this drum lifter. The drum gripper attaches firmly to the upper lip of the drum. Different drum designs are catered for by the operator by simply moving the position of the top hook. As experts in the drum handling field we are always here to assist you should you require a custom gripper for an unusual or new drum type. Sixteen precision bearings allow the lifter section of the drum unloader to slide left and right. 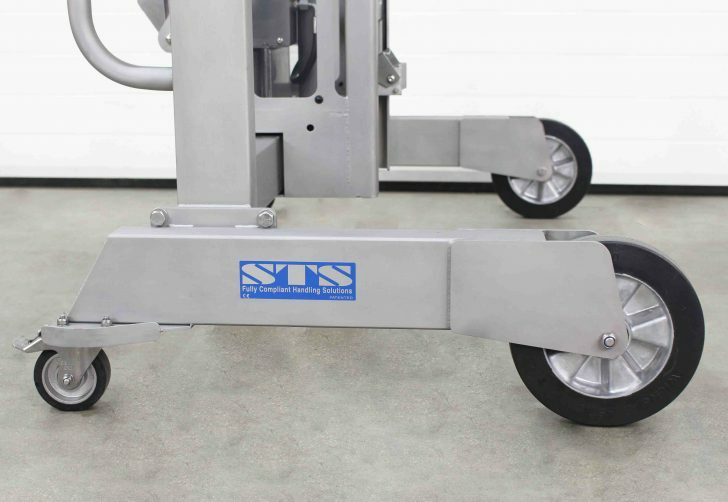 The sliding mechanism allows drums to be positioned accurately on a pallet or in the workplace. Due to the extremely low rolling resistance of the bearings, the lifter slides effortlessly even with a fully-loaded 350kg drum attached. The lifter body is locked in position using a simple hand-operated toggle clamp. The ladder rack at the front of the drum unloader features a number of different mounting positions. The drum catch can be positioned at different heights for different heights of drum. To reposition the drum catch, a pin is removed, the catch is repositioned and the securing pin re-fitted. The modular rack design allows us to create custom attachments for any unusual drums or bespoke applications. Each stainless steel drum unloader is fitted with a UK-made hydraulic pump assembly. The pump supplies hydraulic oil to a stainless steel sheaved lift ram. The pump itself is encased within a sealed shroud to protect it from dirt and debris. To operate the pump operators simply pump the rear handle back and forth; a precision valve provides control when lowering the drum back down onto the floor or a pallet. All hydraulic circuits are fully cleaned and tested before dispatch ensuring zero defects. 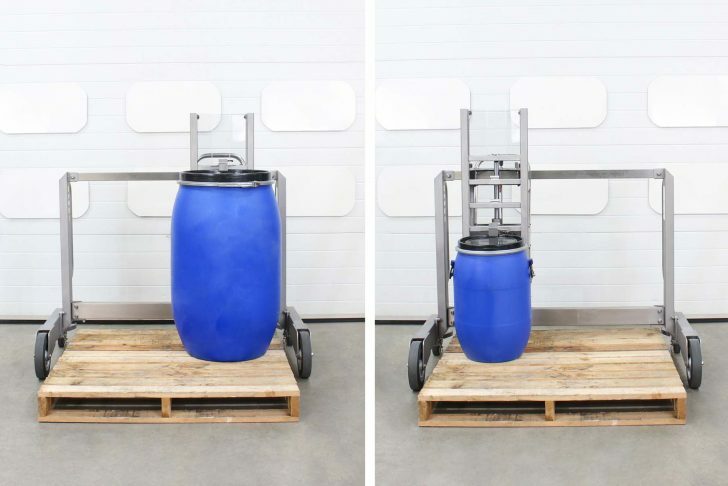 Depending upon the application we fit a range of different wheel types to our drum lifters, each selected for their performance in different conditions. For food and pharmaceutical areas we can fit plastic-centred wheels with polyurethane tyres. When ATEX is a requirement we install tyres with an aluminium centre and an anti-static or conductive tyre compound to ensure no build-up of static electricity. All wheels we fit include rubber-sealed (RS) precision bearings as standard which offer premium wheel performance in harsh environments. In order to get the most out of this unit we recommend it is used on smooth level surfaces. 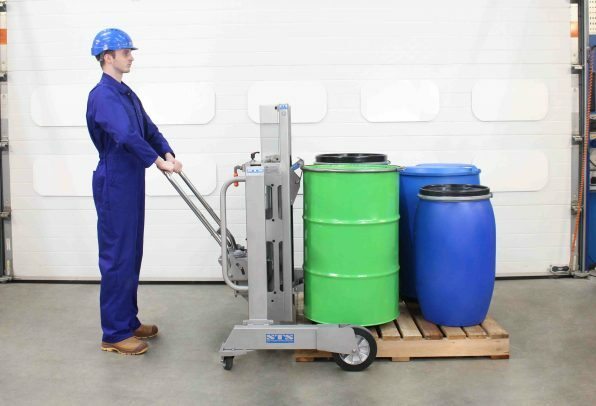 Using the unique adjustable drum catch our Side-Shift Drum Unloader can handle a huge variety of different drum types and sizes from 50L to 220L, both steel and plastic. Please see the drum suitability document below for a complete breakdown of the drums with which this product is compatible. This is only a sample of the hundreds of compatible drums, if the drums you use are not in the specification please contact us. Within certain industries explosive or potentially explosive atmospheres exist as a by-product of the materials and manufacturing techniques being used. These areas are classified as ATEX and are classified Zone 1, 2, 21 or 22. 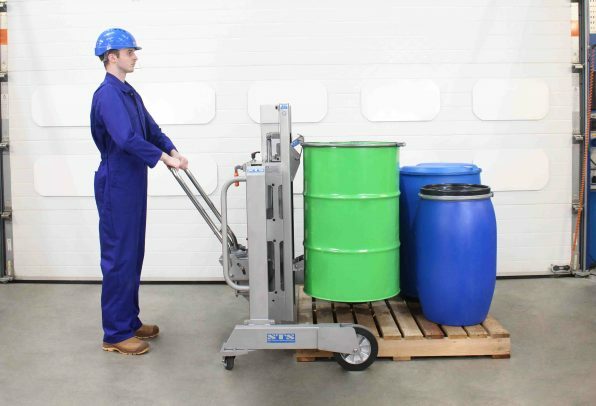 We offer a range of ATEX drum loaders with anti-static wheels, anti-static clear guarding and earthing chains for use in these hazardous environments. We ensure electrical continuity throughout the unit, we supply our ATEX units with a manufacturer’s EU Declaration of Conformity. Suitable for use in an ATEX Zone 1, 2, 21 and 22 environments. Certified to ATEX Directive 2014/34/EU: for equipment intended for use in potentially explosive atmospheres. 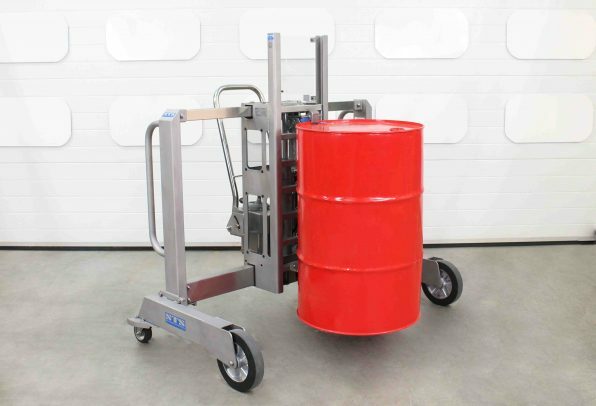 We can provide this unit with a taller lifting ram, allowing you to place drums onto high containment bunds should this be one of your requirements. See the full technical specification for our Stainless Steel Side-Shift Drum Unloader for details such as weight, dimensions and load capacity. View the instruction manual for our Stainless Steel Side-Shift Drum Unloader, which details how to safely operate and maintain the unit.